If you close your eyes, you can almost hear the beat. In Cienfuegos, it surrounds you. On the waterfront, wine is poured, music starts, and couples dance, simple pleasures but unforgettable. 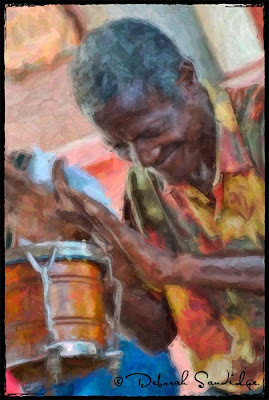 Cuban clocks never seem to slow down and music is heard well into the night. The sounds are colorful, vibrant, exciting, and I wanted to illustrate this in a photograph in a more artistic way. I had great fun photographing the drummer, enjoying the music at the same time. Brushstrokes of color blur the line between painting and photograph by using Snap Art, a Photoshop plug-in that gives the photographer an artist's palette.